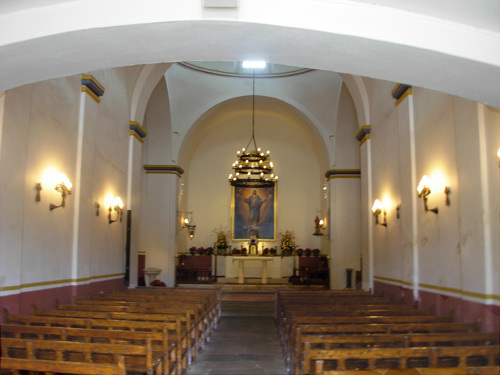 from the blending of Spanish and Indian traditions that took place here at Mission San José." 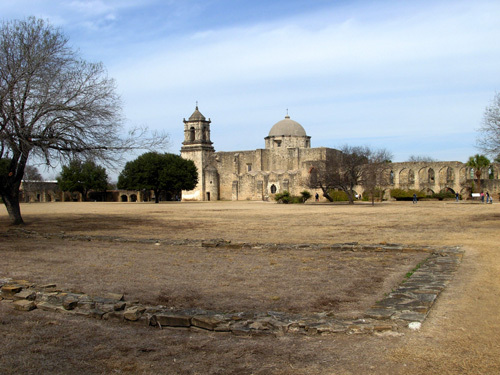 - from the brochure, "San Antonio Missions: Mission San José,"
I think one of the reasons San Antonio is such a great place to visit today is the respect the residents have for their multicultural heritage. Preservation is important here. They haven't razed the old missions because somebody decided the land could be used for a "higher and better use" like an apartment building or big box store that would bring in more revenue. I love some of those big box stores but I wouldn't quietly acquiesce if someone wanted to destroy an historic site to build one. I'm glad these sties are preserved as national park property. Visiting San Antonio is almost like being in a foreign country to these two Midwesterners even though we've also lived in the West and South most of our adult lives. The Hispanic influence is evident in every part of our country (except maybe the Northeast), but in the Southwest the heritage and culture is well-preserved and more obvious. It's amazing to consider how diverse this country is. I love that! 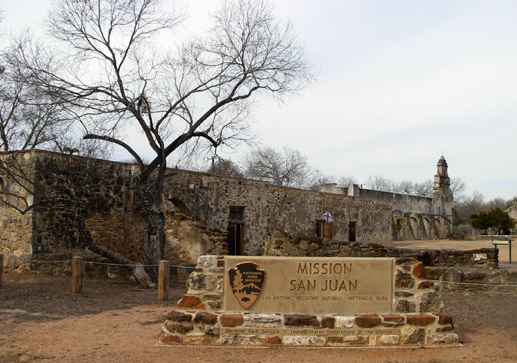 In this entry I'll focus on what the four missions in the San Antonio Missions Historical Park look like today and give a bit of the history of each. You already know from the last entry why and how the missions were established and how the Native Americans were assimilated into Spanish society. I also showed half the mission photos in that entry. The new photos in this entry will be more like a tour than an examination of the architecture and details. 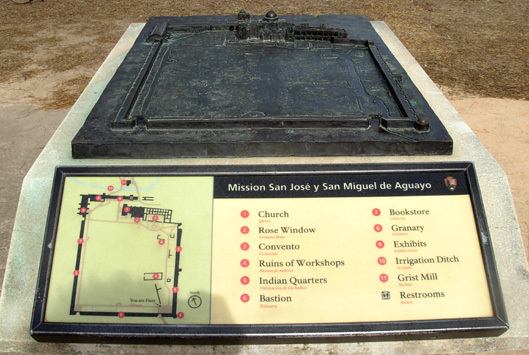 That's a lot easier than its full name: Mission San José y San Miguel de Aguayo! 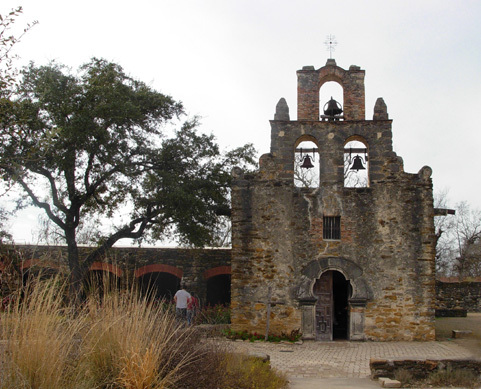 Mission San José was the second of five missions established in the San Antonio area in the early 1700s. 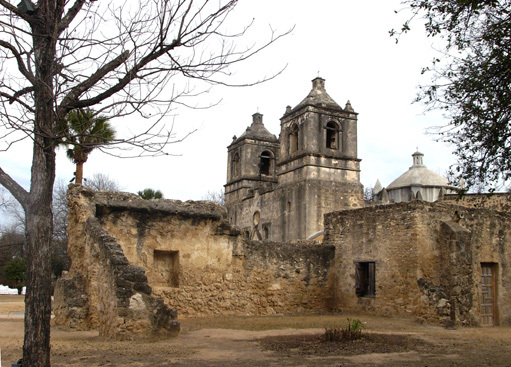 The first was Mission San Antonio de Valero (AKA the Alamo), built in 1718. Two years later Father Margil de Jesus, a veteran Franciscan missionary, saw the need for a second mission in the area (mostly because of all the Coahuilatecan Indians they could convert!) 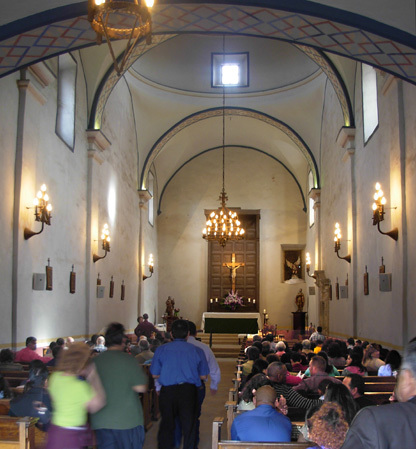 and gained the blessing of the governor of the Province of Coahuila and Texas to found and build Mission San José. 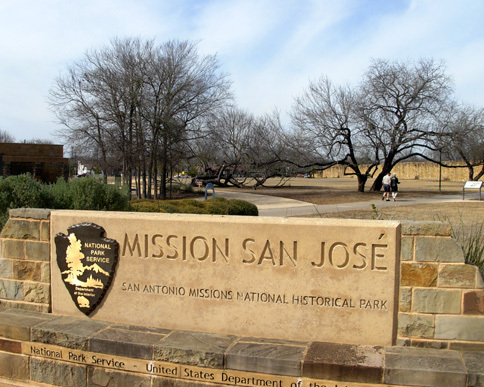 San José became the largest and most successful of the four newer missions along the San Antonio River, earning the distinction of the "Queen of Missions." It was a model of mission organization and a major social and agricultural center for the region. During its peak years approximately 350 Indians lived in eighty-four two-room "apartments" around the perimeter of the mission. Some of the Indian quarters are open to the public. 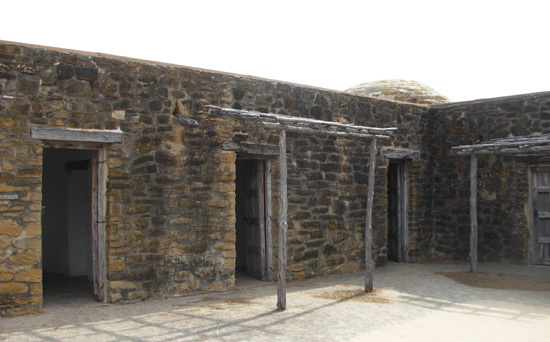 Although the adobe-walled rooms look small to us now, they were an improvement over the shelters in which they lived before the mission was built. 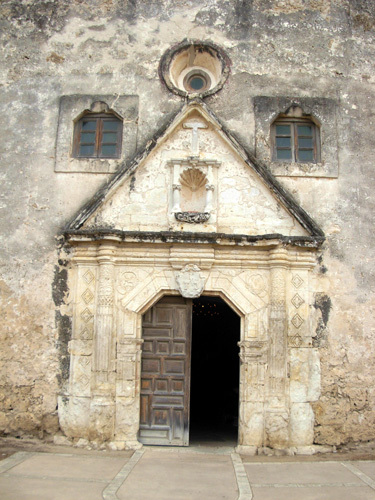 This limestone church is considered to be an extraordinary example of Spanish colonial Baroque architecture. It replaced the original church that served the community when the mission was established sixty or seventy years earlier. The lower arched building to the right of the church is the convento, housing for the Franciscan priests, missionaries, and their visitors. Although small and Spartan, they were probably better digs for the Spaniards than where the Indians lived. Visitors are routed past this neat little window . . .
. . . and this wall . . .
. . . to the back side of the mission. 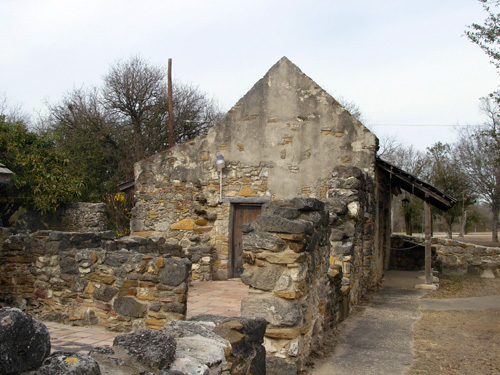 A grist mill that was operational in the late 1790s to early 1800s stands behind the convento and church, outside the massive stone wall that served as a defense. I showed photos of the grist mill and talked about the acequia system of irrigation in the last entry. 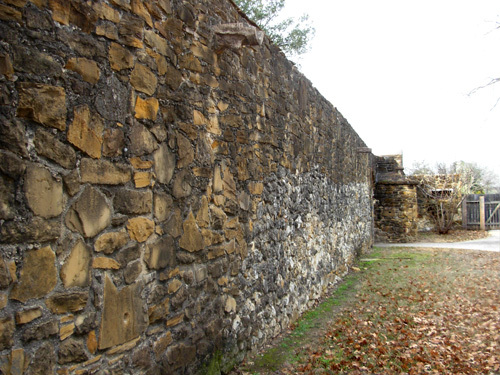 The thick walls surrounding the large site make the mission look like a fortress. I'll show this photo again because it includes one end of the large granary (right side of photo) built in 1755. 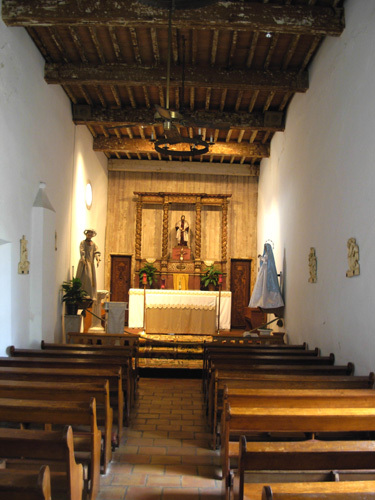 It was also restored in the 1920s and '30s when the church was restored. Each mission was surrounded by large, productive fields and pastures. 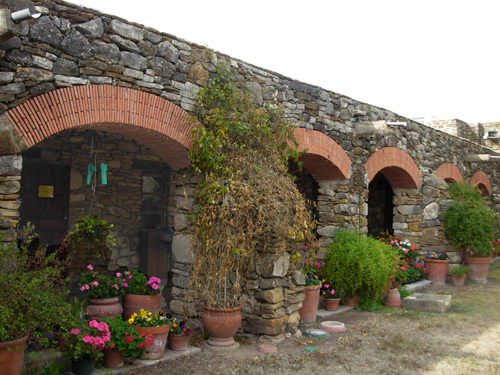 The granary was used to store corn, wheat, and other grains that were grown here. You're probably wondering if I'm going to show you this many photos from each of the other three missions! Nope. San José has more remaining structures than the other missions, the architecture and details are more elaborate, and there was just more stuff to photograph. It was also the first mission of the bunch that we toured, so I may have taken more pictures at San José for that reason, too. (If you have more than one child, you know what I'm talking about!). Mission Concepción has lots of things to photograph, too, but I already showed you most of those pictures (primarily the frescos) in the last entry. These four sites are all very different in appearance, both now and back in their heydays. 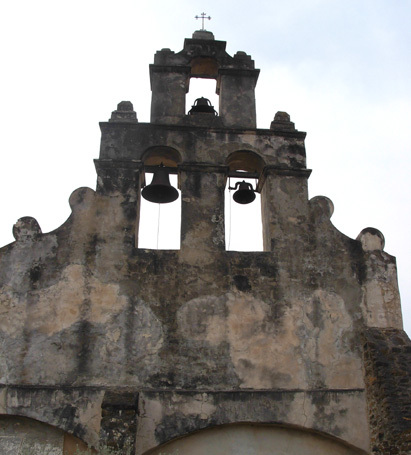 Let's go see the two less-elaborate ones next, and I'll finish up with the elegant Mission Concepción. As with the other missions, this one has a longer formal name: Mission San Juan Capistrano. But that wasn't its original name. 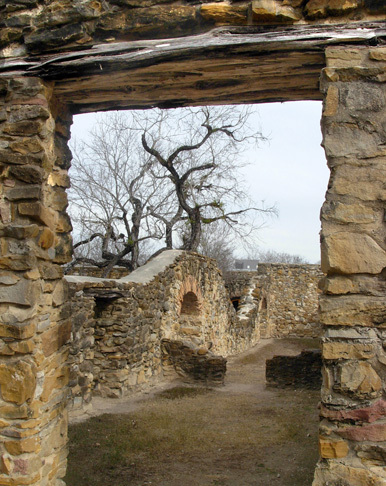 The mission began in the woods in eastern Texas back in 1716 as Mission San Juan de los Nazonis, where it served the Nazonis Indians. 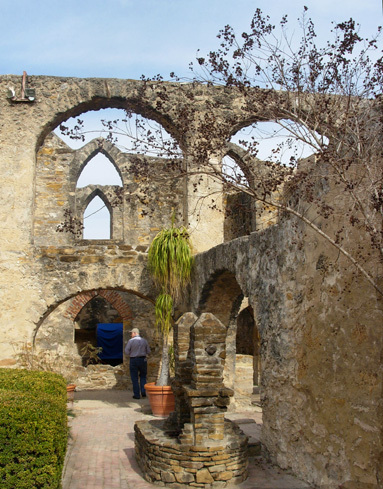 The mission was not successful, so everything that could be moved was transported to the San Antonio River in 1731 and reestablished as San Juan Capistrano. There were still adversities in the new location (epidemics, drought, aggressive Apaches and Comanches), but the mission persevered and grew to include over 200 Coahuitecan Indians by 1762. Many of the buildings are in ruins or gone now. At its height, the mission had a granary, textile shops, and adobe houses for the Indians. This mission usually enjoyed a surplus of food because of its fertile lands in the river's flood plain. Acequias also provided a reliable supply of water. The Indians raised corn, beans, chilies, melons, cotton, sugar cane, and squash. 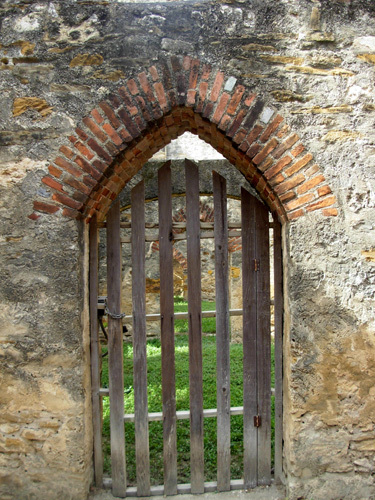 Surplus produce and cattle were traded with the other Spanish missions and settlements in the area, with Mexico, and probably with French settlements in Louisiana. That agricultural legacy in this area continues today. Of course there's a longer version of the name: Mission San Francisco de la Espada ("Mission Saint Francis of the Sword"). I'm surprised it's not nicknamed Mission San Francisco but maybe there's another one of those somewhere. 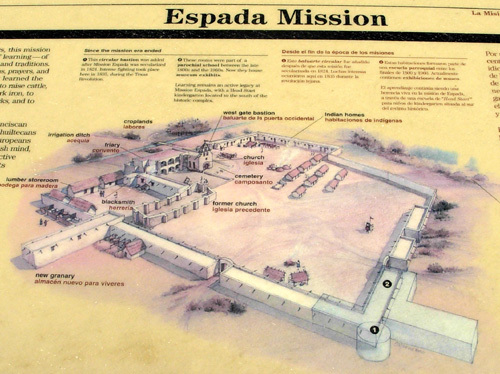 Like several other Spanish missions (there were six in all), Espada was originally founded in east Texas as a buffer against French encroachment from Louisiana, ran into too many problems there (diseases, floods, fires, enemies, and limited supplies), and was relocated farther west. 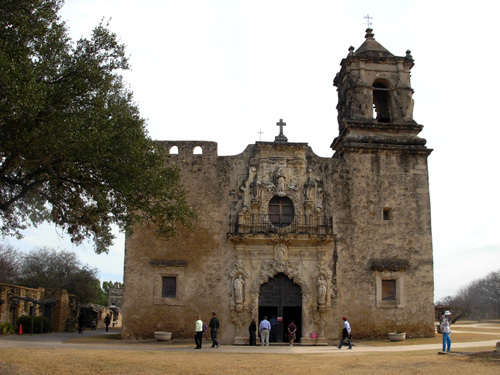 It was the oldest of the missions, begun in 1690 as San Francisco de los Tejas. 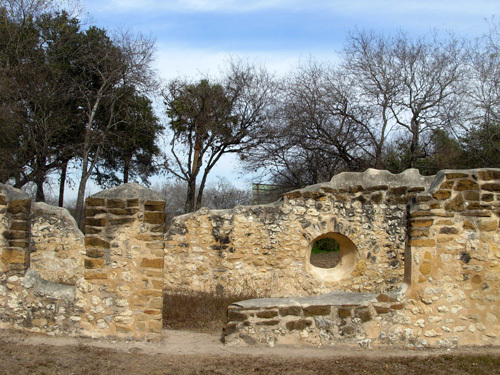 It was reestablished at its present location along the San Antonio River in 1731. It is the southernmost of the missions here, although not as remote now as it must have seemed in the 18th century. 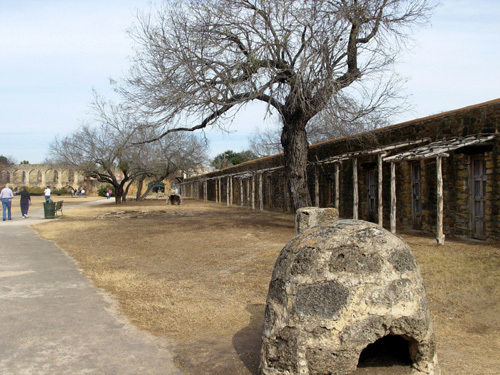 I mentioned in the last entry about all the building (and other) skills that were taught to the Indians living at the missions. 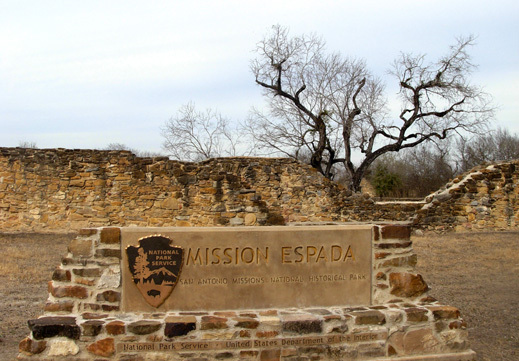 Espada is the only one of these missions where the Indians made bricks and tiles. Some of those bricks are still in evidence today. This mission apparently wasn't as successful economically or socially as the others. By 1794, when the mission was secularized, it was impoverished. There were only fifteen families left. Each was given land but they had to share the remaining equipment and supplies. An inventory showed eight yokes of oxen, one cow, one calf, four horses, three mules, lots of sheep (1,150), two looms, a few spinning wheels, one pair of shears per family, three pounds of steel, 98 pounds of lead, two cannons, 25 pounds of iron, and 875 pounds of wood! Talk about tradition! How common is such continuity in our rather young country? This is much more like European and other cultures that have survived for millennia and not just a few centuries. I don't have anything (well, not a lot) against progress, but it's nice to keep some traditions going, too. That's what I was talking about at the beginning of this entry -- one of the reasons San Antonio appeals to me so much -- the respect for history. 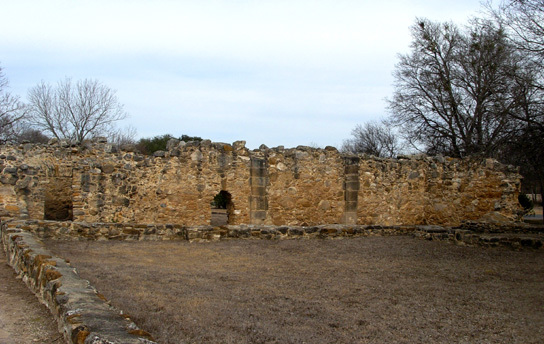 The mission of Nuestra Señora de la Purisima Concepción de Acuña is the third of six missions from east Texas that was transferred to the San Antonio River Valley in 1731 (busy year for those Spaniards!). 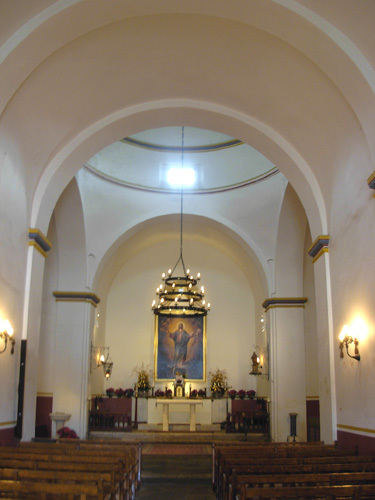 It was named in honor of Our Lady of the Immaculate Conception and Juan de Acuña, who was the Marqués de Casafuerte (Viceroy of New Spain AKA Mexico) when the mission was moved. Two people, long name. Artist's conception of Concepción at its peak. Note the quarry in the right foreground. I haven't read how many Indians lived here at the mission's peak, but it must have been a lot from the size of the site and the church. Although fewer walls and buildings remain here than at Mission San José, the church at Concepción is in better shape and even more impressive to me. This is the one I mentioned in the last entry that is reportedly the oldest un-restored stone church in America. The beautiful Baroque church looks much like it did when it was dedicated in 1755, although the colorful geometric designs on the exterior walls have disappeared after weathering for over 250 years. One reason for the church's integrity is the fact that it was built on bedrock and hasn't settled. 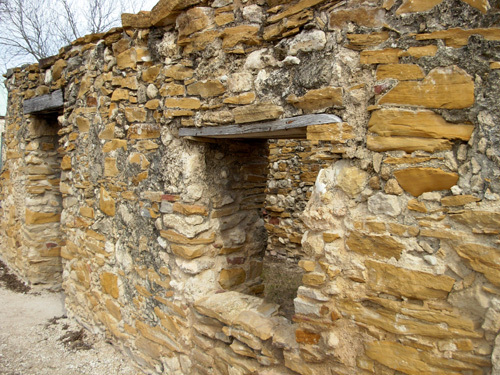 It is the least restored building of any in the Missions Historical Park. See the same link as above, and my previous entry, for photos of the beautiful interior frescos that have been uncovered in recent years in four of the church and convento rooms. Those are also fairly well preserved over time because of the structures' integrity (i.e., the roofs didn't leak or fall in). Deteriorated walls of the school are in the foreground, but the church is in good shape. The sanctuary has a wonderful feeling of light and space. Recent research indicates that the windows in the ceiling were probably placed deliberately to illuminate the altars on specific feast days. 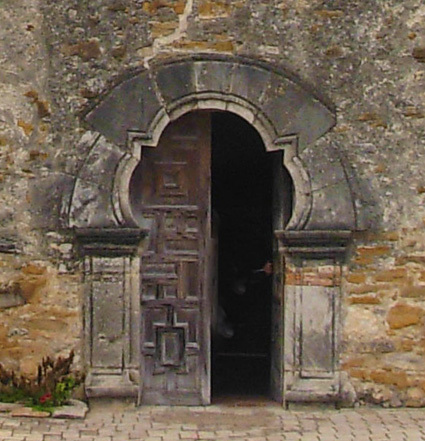 Mission Concepción was the residence of the Father President, the Franciscan missionary who was the local administrator or field coordinator for all the missions in the area, so more meetings and religious festivals were likely held at this site. We enjoyed wandering throughout the church offices and other rooms to the right of the sanctuary. This is where the frescos are located that I showed in the last entry. Go back and see those if you missed them. 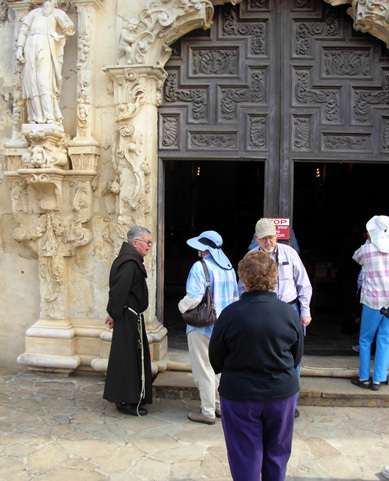 They're worth paying admission to see (but all the missions are FREE to tour). To see more photos of the missions and read more about each one, go to the National Park Service web site, click on "Plan Your Visit" in the menu on the left-hand side, then click on "Things To Do." It took me a little while to find those pages, but otherwise the site is pretty easy to navigate. 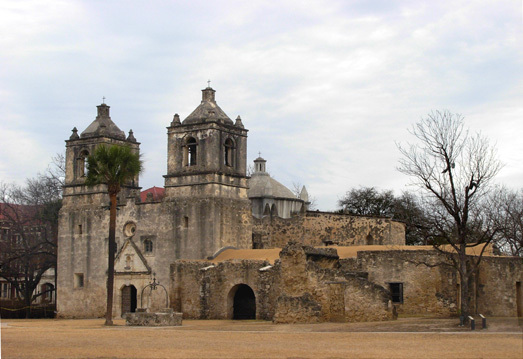 Life at the missions was pretty good for the Indians despite what may appear as exploitation to us in this day of political correctness. Without the missions, the Tejanos faced famine, hostile tribes to the north, epidemics from European diseases, and possible extinction. Although some of them chose to return to their old life, most accepted Catholicism and became active participants in Spanish society. 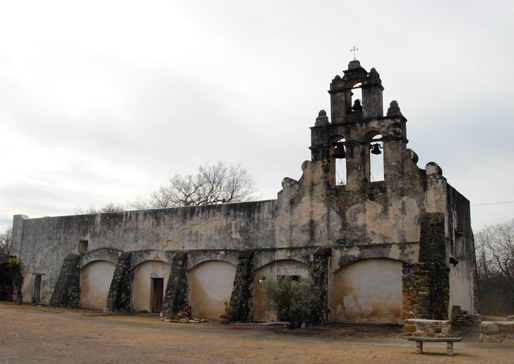 It is estimated that over 2,000 Indians were baptized at Mission San José alone in the 104 years it operated as a mission. Possible ancestors of mission inhabitants? 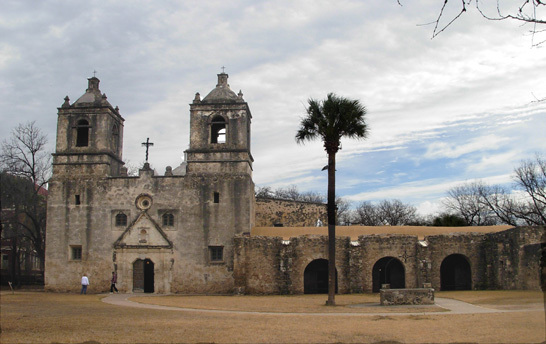 Many people who live in San Antonio today are direct descendents of the Spaniards and Indians who founded the mission communities. Those of mixed race are called "Mestizos." In addition to the settlers who came directly from Spain, there were also many native Mexicans and people from other parts of North America and Europe who settled in this area in the 18th and 19th centuries. 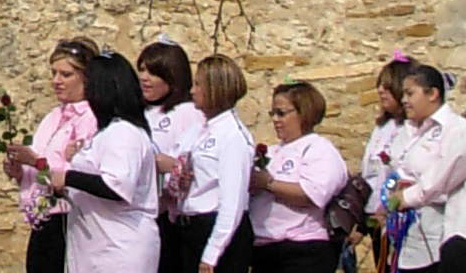 They have all added to the race and cultural mix that is modern San Antonio. I'm glad so much of the mission culture has been preserved. Whether you're deeply religious, an atheist, or somewhere in between, there is much to enjoy and appreciate when visiting these missions.